Our alpine climbing courses are designed to be a mixture of educational elements and time when we practise what we have learned by climbing beautiful routes. We put together all pieces of climbing and mountaineering skills that you need in order to independently plan and carry out alpine adventures safely and successfully. Starting from the former skills and knowledge you have about climbing and mountaineering, we build up and learn and practice new techniques according to your preferences and abilities. You will be leading under the guides supervising. During this 6-day mountaineering course we will start with the first steps of rock climbing and teach you how to climb bolted routes. You will learn and practice belaying, lead climbing and abseiling. Thereafter we will climb multi-pitch bolted routes, alternating the leader. However, most alpine routes require placing your own gear and building your own anchors, so next we will gain experience climbing on natural gear. Throughout this course you will also practice skills of route planning, analyzing weather conditions, and basic mountain rescue techniques. 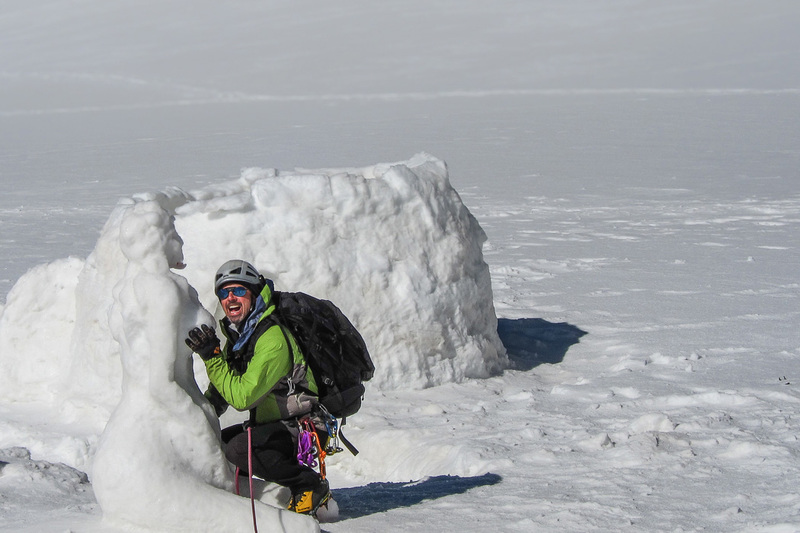 To prepare you for climbing in the high mountains we will also introduce you to ice and snow climbing and learn how to build belays in snow and ice, safely travel on glacier and crevasse rescue techniques. Depending on your level of mountaineering interest, routes can be chosen to involve more or less snow and ice. Typically the routes we climb are graded AD to PD and are exemplified below. Depending on your preferences and abilities we will cover as many of the following topics as possible. Day 1: Visiting any of the local sport climbing crags in the Chamonix valley, going through the first steps of climbing; belaying, lead climbing bolted routes and rappelling. Day 2: Practise multi pitch climbing on bolted routes and learn how to place natural protection and how to build your own anchors. Day 3: Climbing on natural gear, placing cams, nuts and building belays – traverse of the Aiguille du Croushes. Day 4: Today we learn about crevasse rescue, learn how to build snow anchors and how to pull out our climbing partner from a crevasse. Also self arrest and selfrescue out of a crevasse is on the program. Day 5: Today we learn about ice and mixed climbing. We take the cable car up to Aiguille du Midi and traverse the Point Lachenal. We spend the night in the cosmiques refuge. Day 6: We climb the cosmiques ridge. By now you should be able to do the climb as an independent rope party, climbing in the mixed sections with crampoons and building all necessary belay stations, decide wheteher you climb in pitches or moove together and set up rapells. Ability: For beginners to intermediate climbers with a good physical condition. We will start the alpine education where your former skills ends. 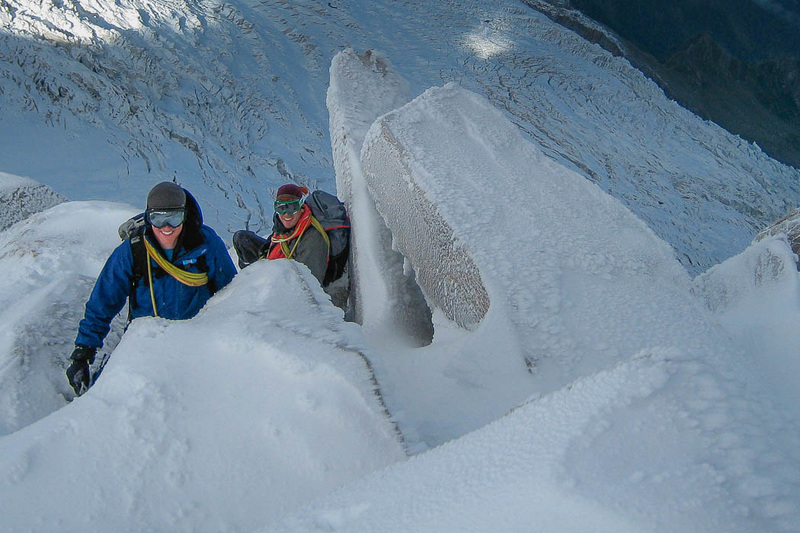 For an first introduction to mountaineering we highly recommend our 5-day Mt Blanc course. Here we build on to the intro course by climbing harder and longer routes. Our training is focused on climbing routes more efficiently and to be faster in different mountain terrains. Efficient rope-work, finding the right belay settings and getting a wider repertoire of belay techniques, together with fast mulit-pitch rappels can save you hours on the mountain, and therefore enable bigger and safer adventures. When mastering climbing techniques to progress quickly on rock, ice and snow we can attack more challenging routes involving mixed alpine terrain. The course also includes mountain rescue techniques, self-arrest and advanced crevasse rescue. After completing this course you will be able to go by your self to the high mountains and independently plan your own alpine climbs. 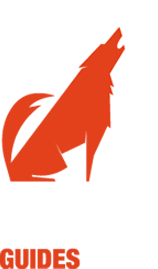 The following program is just an example that will be modified according to your climbing abilities and preferences. Day 2: Alpine rock route on natural gear, going through time-saving techniques and the efficacy of various belay anchors. Day 3-5: Alpine climbs in the Mt Blanc mountain range. We practice climbing efficiently in a mix of rock, ice and snow, using short pitching techniques, taking in coils and moving together. 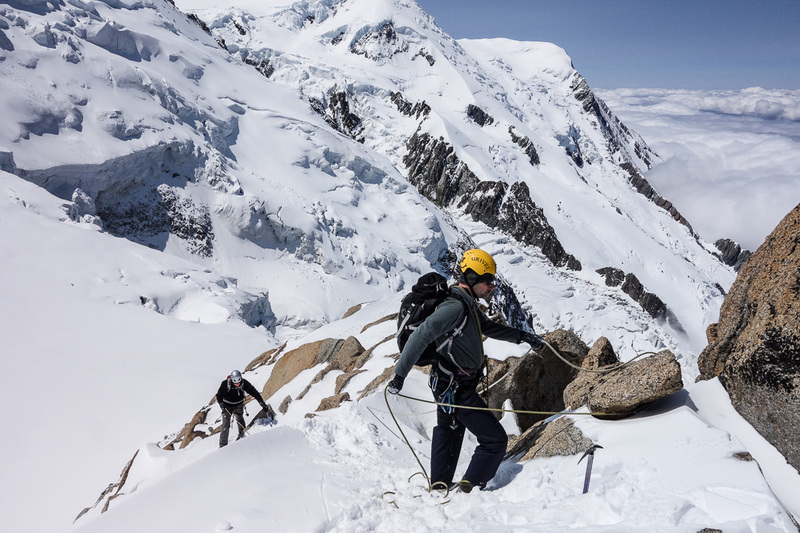 Spending one or two nights in the Cosmique refuge climbing routes such as Contamine Grisolles on Mt.Blanc du Tacul, the Tour Ronde, Pyramide du Tacul or the traverse of the Aiguille du Entreves. Ability: Climbing rock routes minimum grade 5, having climbed multi-pitch routes, being able to lead at least grade 4 on natural gear, having some ice climbing or mountaineering experience, and having a basic knowledge of glacier travel. If you have completed our Alpine Intro Course you are well prepared.